Our family has an addiction – to French fries. My daughter and my father-in-law have an addiction to ketchup. Naturally, you can expect this family to go through a lot of potatoes. Which is cool, because potatoes are waaaaay cheap. 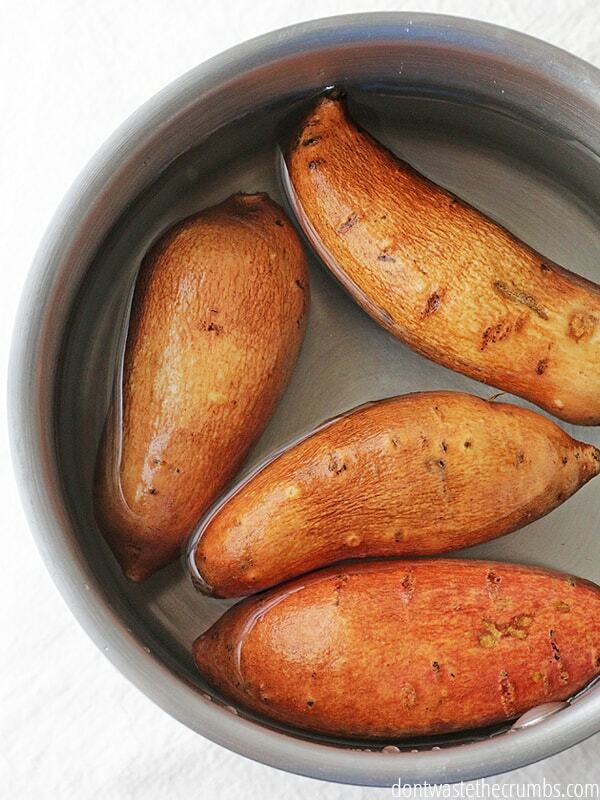 Our solution to eating healthy real food French fries is Crispy Oven Baked Potato Wedges. By simply coating them in olive oil and dashing them with some salt and pepper, they are an amazing alternative to their deep fried counterpart. But you can only eat roasted potato wedges so many nights in a row, before needing a change. Blogging buddy Stacy told us about her recipe for crash hot potatoes, which we started making instead. Because they’re oh.my.goodness.amazing! But then we started receiving all these sweet potatoes in our CSA box and also inherited a few boxes from my father-in-law (who is a chef). So we started making sweet potato fries… over… and over… and over. I’m honestly not a huge fan of sweet potatoes. Mrs. Crumbs is a big fan and likes them all sorts of ways, but I’m partial to fries. But even a French fry lover can tire of fries after a while and we needed a change. Mrs. Crumbs suggested I crash ’em, so I did! And ta’ da. You get “crashed sweet potatoes” to add to your awesome vegetable list and yes, I give Stacy all praise for inspiration to our twist on her original recipe. Crispy sweet potatoes with a heavy dash of seasoning turns ordinary potatoes into a fun and extraordinary side. 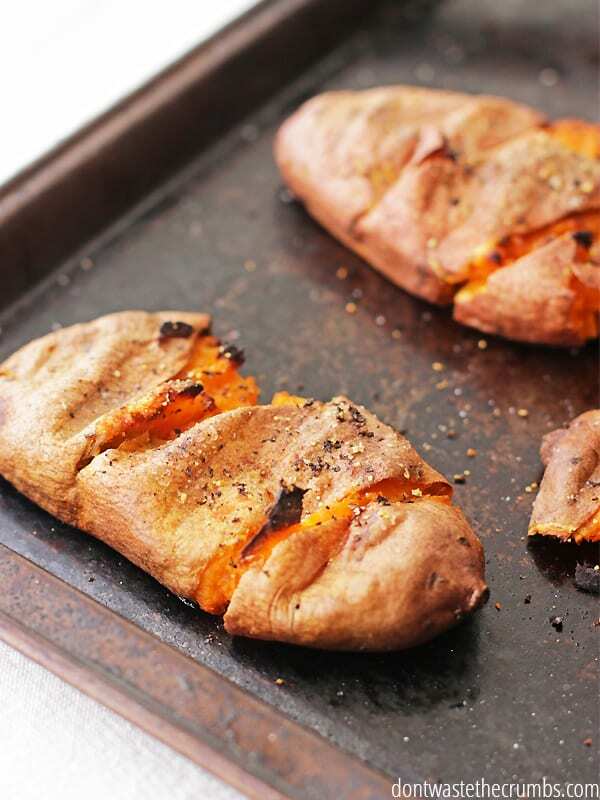 There are few twists to this recipe in that sweet potatoes contain much more moisture than a standard russet or red potato – so here’s the “how-to” on creating this delicious dish! Boil the potatoes until they are soft and you can easily stick a fork in them. 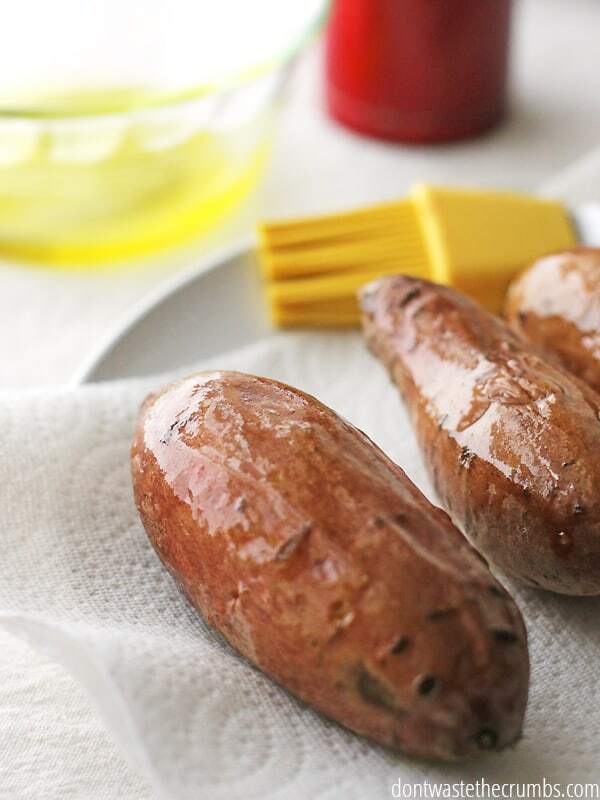 Place the cooked potatoes on a towel, allowing them to cool and dry. Baste one side of the potato with olive oil. Flip the potatoes (olive oil side down) and make a few slits in them with a knife. Smash the potatoes with a fork. Allow them to sit on the towel for 2-3 minutes (eliminating the excess moisture). Transfer smashed potatoes to cookie sheet. Baste with olive oil and sprinkle with salt and pepper. Bake at 450F for 40-45 minutes. Bring a large pot filled halfway with water to a boil. 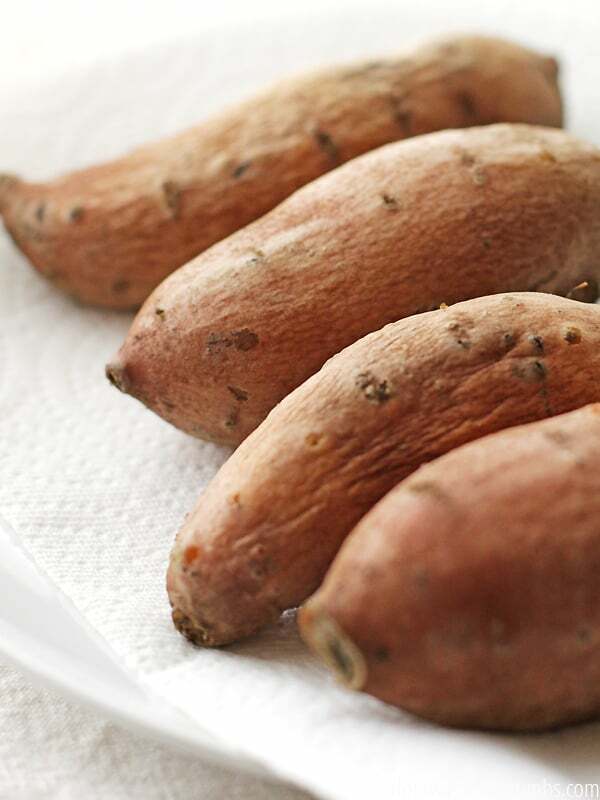 Boil the sweet potatoes until they are soft and you can easily stick a fork in them. Place the cooked potatoes on a towel, allowing them to cool to the touch and dry. Baste with olive oil and sprinkle liberally with salt and pepper. Sweet potatoes contain more moisture than regular potatoes, so it’s important not to skip the few minutes of resting in between the steps. To speed the process up at dinner time, you can boil the potatoes earlier in the day, or even earlier in the week, and then crash them the night of dinner. We like to make extras so we can make a hash with eggs for breakfast! Remember that sweet potatoes are in season in the fall and winter, and they store really well. Aim for $1 per pound or less and you’ll be loving this dish even more! Total cost for Crash Hot Sweet Potatoes is $2.70! 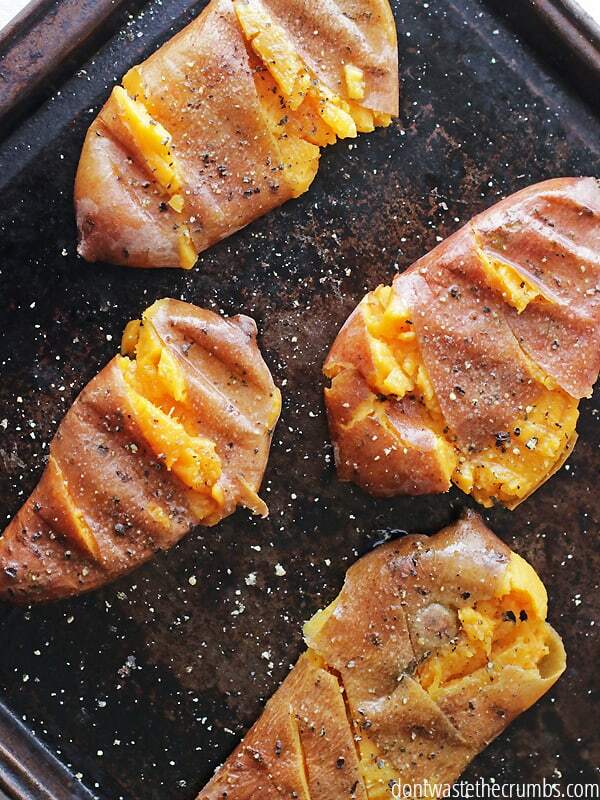 What’s your favorite way to enjoy sweet potatoes? Are you eating the skins or scooping them out? 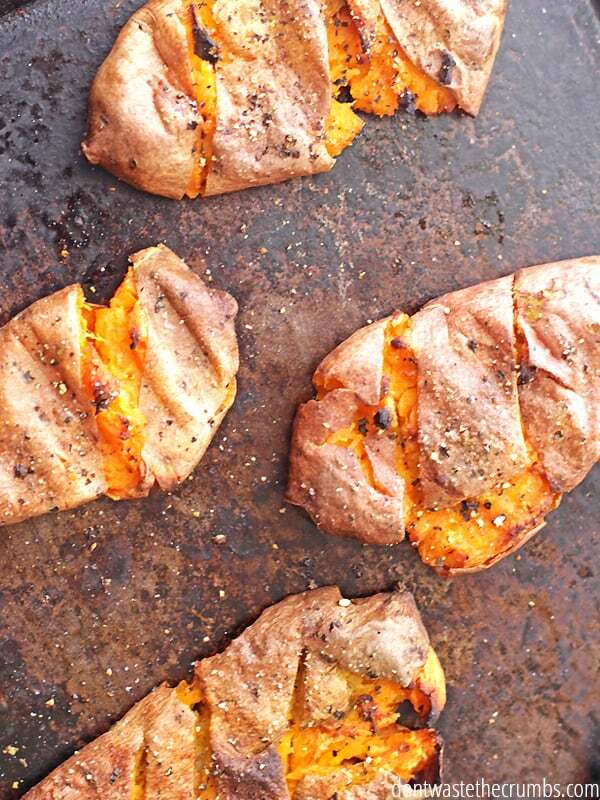 I was of the understanding that sweet potato skins were one of those things you shouldn’t eat. I always eat the skins! I was under the impression the skins were the best part, lol – do you have a link to share stating otherwise? Sweet potatoes are in the clean fifteen list from EWG, while “standard” potatoes are in the dirty dozen. So I guess it is ok to eat the skin even if they are not organic, since the skin will provide you with a lot of good stuff. These sound delicious! I make redskin potatoes this way all the time. My favorite way to eat sweet potatoes is to make hash. Fry some diced bacon and remove from pan. Add diced (I peel but I suppose you don’t have to) sweet potatoes and a diced onion. Fry until soft and lightly browned. Put the bacon back in and serve. This has replaced the gooey sweet casserole at Thanksgiving too. Your “hash” sounds delicious. Can’t wait to try it. 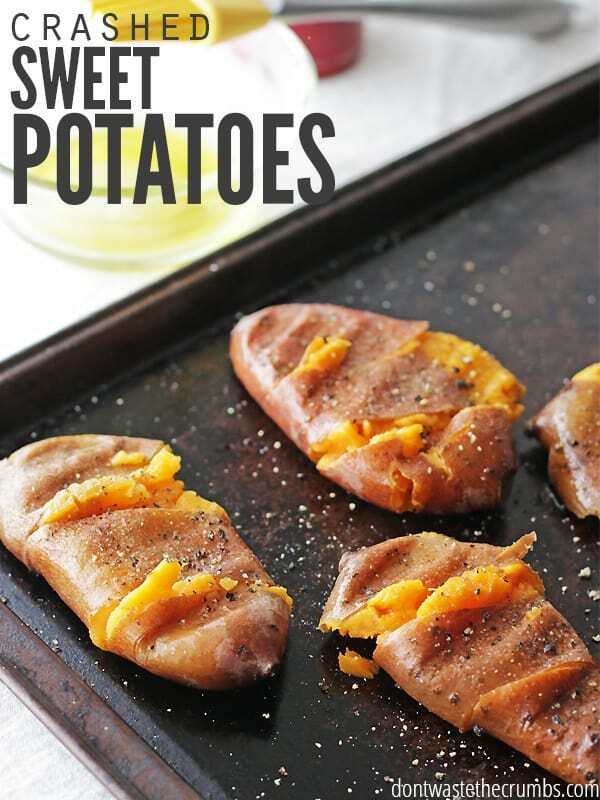 I do this using half sweet potatoes and half regular potatoes. Then add some sliced green onions on top for serving. My favorite!!! I have a big problem with the sweetness of sweet potatoes. I need to eat them instead of the regular types, but I’m really in a big need of ways how to make them taste as a main dish, not as a dessert srinkled with salt. I’d appreciate any idea. 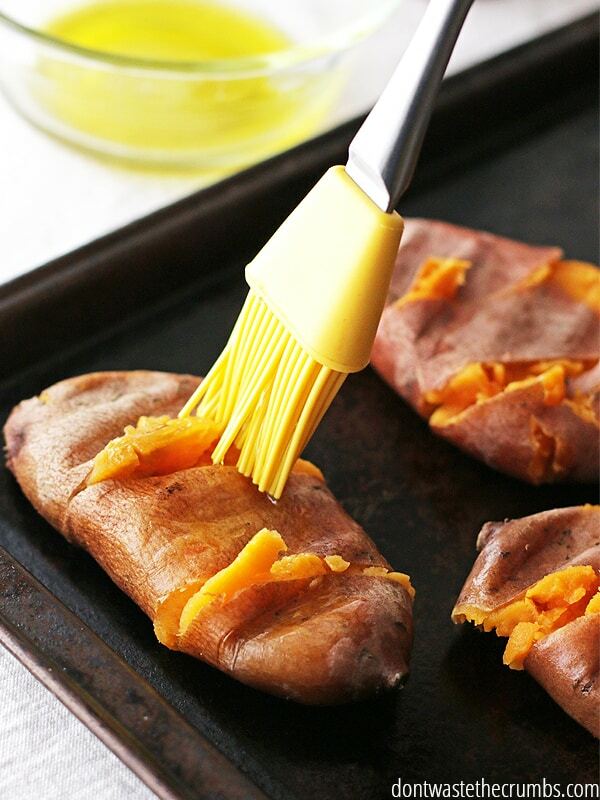 So you want sweet potatoes to taste less sweet? What about adding savory items, like eggs, greens or other root vegetables? Maybe savory seasonings too? I cube up sweet potatoes and slice or cube up other root veggies, celery, mushrooms, garlic etc. and toss them all in olive oil and rosemary and roast them all together. I don’t notice any excess sweetness in that dish. It tastes wonderfully savory to me, perhaps because of the seasonings used. Maybe give that a try and see what you think. You can experiment with the herbs, or maybe use some cayenne or chilis instead and see if that negates enough of the sweetness for you. I toss mine with olive oil, salt and pepper and garlic and chipotle powders. Or go Italian and use oregano, thyme and garlic powder. Another nice way to have them is baked then add a little butter and a splash of lime juice. My husband isn’t really too fond of them any way i make them, but i do anyway because they’re so good for us and I love their flavor! I’m going to try this recipe on him next time i have them around. I like the idea of adding chipotle peppers Gina. That would really add a Southwestern flare to the flavor. My husband isn’t a fan either, but like this? He DEVOURS them. I hope yours does too! I actually made these once so far, but I don’t remember if I changed the method… Why not just bake the potatoes, then smash them? (And then do the rest of the recipe.) Seems more straightforward and less dishes and towels… ? Sarah – if you bake them first, you end up with mashed potatoes. By boiling first, you cook the inside, but just enough to make it soft. Then you crash them to create more surface space, that allows for more crispy spots. You can try baking them and then smashing, but I really don’t think it will work. Feel free to prove me wrong!